Join us at the Heard Scout Pueblo for two days of outstanding leader specific training. Don't miss this opportunity for leadership training, fellowship, and networking with your fellow Scouters while enjoying a delicious dutch oven pot roast dinner Sunday evening! This is a combined course which will cover BOTH BALOO and IOLS. If you only need IOLS you will be dismissed at about 11:00am on Monday. Recommended for all Boy Scout leaders and for those wishing to take Wood Badge training. Required training for: Cub Scout leaders to take the Pack or Webelos Dens camping. 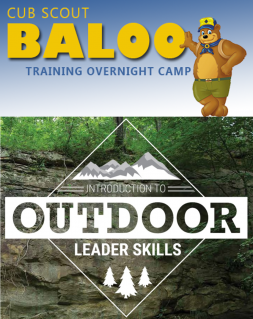 The new BALOO course REQUIRES an overnight stay. Recommended for all Cub Scout leaders and for those wishing to take Wood Badge training. This combined course is designed as an introductory class and will satisfy the requirements needed to take Packs or Webelos Dens camping, and required training for Scoutmasters and Assistant Scoutmasters. The benefit to Cub Scout leaders is that after taking this one training they will be prepared for Scouts BSA. Leaders will not be required to retake an Introduction to Outdoor Leader Skills class for Scouts BSA. Participants are required to stay overnight as a part of this course. Participants will be staying in their own tents and working together as Patrols throughout the weekend. You will be learning various cooking techniques as you prepare the meals for the course. Our instructors will guide you on how to set up your campsite and how to prepare the meals. Lunch and Dinner on Sunday and Breakfast on Monday will be provided for IOLS Only participants and BALOO participants will also have Lunch on Monday. BALOO participants must complete the online prerequisites my.scouting prior to arrival at the in person portion. Please print all attachments including Health Form A & both B's.